Your insights and accomplishments have prepared you to take some bold, but calculated risks. You know you’ve already come a long way when you see the Two of Wands. As you stand behind your castle’s battlements, your authority and wealth can be seen for miles. From here, you can easily survey the rich towns and fertile lands or your domain. The staff behind you on the Two of Wands tarot card is securely fastened to one of the battlements. It shows that you have used your talents wisely. 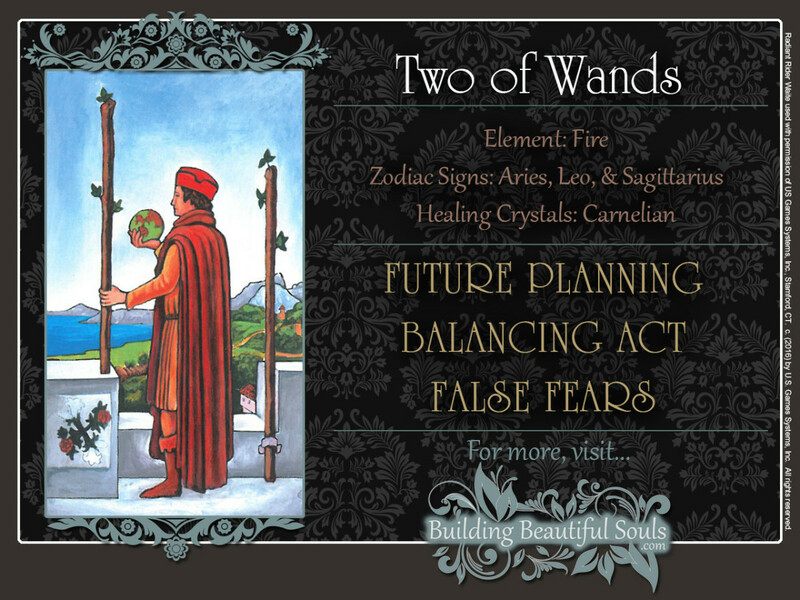 Still, those grey walls on the Two of Wands are becoming a little monotonous and cold. Perhaps, your success has isolated you from others. Or you’re wondering what else is out there. In the Two of Wands, the cross on the left battlement, balancing the lilies and roses is an important clue. The lilies symbolize the need to be free from desire. Your success has already accomplished that. But the roses show an insatiable hunger for knowledge and experience. You’re longing to explore the world to find out just how big it really is. An average life isn’t enough for you. Pondering the globe in your hand, you’re after true greatness – the kind that will put you in the history books. In the Two of Wands tarot card, the staff in your left hand shows that you definitely have what it takes to achieve greatness and get other’s to help you along the way. The man’s red hat symbolizes his passion. His orange garment is his vitality, while his brown cloak keeps him grounded enough to prevent him from doing anything too foolish. Astrologically, the Two of Wands card corresponds to Mars in Aries. Because Mars rules Aries, the volatile energies in this card are channeled in constructive ways. Initiative, courage, and foresight will allow you to accomplish your goal. And the further you can look ahead, the better. The Two of Wands is a card of accomplishment, opportunity, and risk. The Two of Wands is the sign that you are ready to take the creative spark of inspiration from the Ace of Wands and ignite it! Right now, you’re in very good shape, and the outlook for the future is promising. But where things will actually go depends on you. You’ve put yours skills and talents to good use. That’s how you got to where you are. Even better, you’re a long way from running out of steam. In fact, you are feeling restless and bored. Maybe you’re even a little lonely. Some of your old friends haven’t been able to keep up with the breakneck speed at which you’ve raced to the top. In this sense, your success has cut you off from the rest of the world. Or is it that you’re ready to move on to bigger and better things? The good news is that you have what it takes. Even better, others are taking notice, and some excellent opportunities are coming your way. To move forward, it’s important that you have done your homework and are willing to go the distance. Remember, it takes at least ten years to become an overnight sensation. For example, you may think about quitting your job so you can start a business. Having a great concept, talent, and the right opportunities are the minimum requirements. You already have them. A well thought-out business plan, however, can spell the difference between success beyond your wildest dreams and failure. While you can always clock out at the end of your shift at your day job, running a business often means putting in extra hours to get the job done. Working out all the details and keeping the big picture in mind will do much to tip the scales in your favor. If your vision of greatness is still just a vague idea, you will still need to spend more time hammering out the details. The Two of Wands tarot card also suggests that you have made a commitment to bettering your life. Perhaps you’re thinking about going back to school. Or you’ve decided to change old thinking patterns that have been holding you back. Look to the future. Jump into action when you’re ready. If you’ve been bored lately, things are about to get exciting very soon. Be prepared for anything. More importantly, have fun! When the Two of Wands is reversed, it’s a good time to review your priorities and long term goals. Are they in line with who you really are? This tarot card is a much less dramatic version of The Tower. It’s actually more like Mom ripping up your favorite t-shirt because it looks like a 3-D model of a Swiss cheese. While it’s happening, it may feel like an extinction level disaster – but you do have 567 other shirts in your closet. It’s only as bad as you want it to be. On a broader scale, the reversed Two of Wands challenges you to examine and overcome your fears. It encourages you to take risks that will profit you in all aspects of your life. For example, a not-so-embarrassing mishap may nudge you into a conversation with someone you’ve been attracted to – but were too shy to approach. Did you know that many important scientific breakthroughs were “lab accidents” turned into opportunities by creative thinkers? One such accident led to the discovery of penicillin. The Two of Wands tarot card encourages you to look at long standing problems in new ways, to step out of your box – mentally or physically. Traveling to a place you’ve never visited before can inspire you in ways you can’t begin to imagine. Seeing the immensity of the Grand Canyon in person or floating thirty feet above a coral encrusted shipwreck while scuba diving are powerfully transforming experiences. Striking up a conversation with a stranger as you’re waiting in line at the post office will definitely break the monotony of a long, boring wait. It can even be the beginning of a lifelong friendship! Kabbalistically, the number 2 corresponds to the sphere of the Zodiac. Here, it refers to keeping the big picture in mind. In traditional numerology, it is associated with the vision and abundance of possibilities offered by the moon. Here, the fiery energy of the Suit of Wands gives you the boldness to pursue your dreams.